Brian and I were married in 1980 and live in Marysville. We have two kids, Brianna (24) and Jason (21). Brianna graduated from the University of Washington and is working in Redmond. Jason will graduate this year from Pacific University and will be working at an accounting firm in Portland. We own auto glass shops in Marysville and Lynnwood and I work for an Engineering firm in Everett. We love to spend time with our friends and family fishing, dirt bike riding and camping. If you would have asked me when I was in high school what I would be doing for fun in 30 years I would have never said that I would be fishing. My first experience fishing was on Martha Lake for trout when Brian and I first started dating when I was 16. I have moved up from trout and now and I love to fish for salmon. The largest one that I have caught so far was 40 pounds. 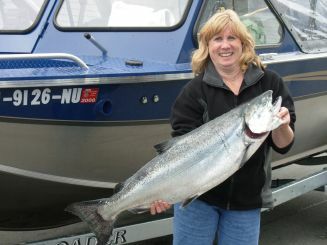 It just weighed enough to be larger than the 38 pound one caught by Jeff Molenda. He will tell you that I pushed him out of the way to get to the rod but don't believe him! Hope to see everyone at the reunion.